Mark and Vana Flores (Father and Mother). Owns a small portable space that can store objects. Its limits are unknown and the usefulness of items obtained from the space is questionable at times. Ada is an attractive young woman with gold green cat's eyes, black and white cat's ears and tail. She generally wears silly costumes to show off but has plenty of normal clothing as well. She's very recognizable no matter what she's wearing. Ada Clover is the former star of television show "Everyone Loves Neko with Ada Clover!" She is a young, ambitious catgirl that loves the spotlight and loves people paying attention to her. Since her show is over with, what's a better way of getting this attention than becoming a superhero? Not only is she attempting to be a hero she's also recording everything for her web show "Ada Clover's Superhero Patrol Show!" This (heavily edited) series shows the adventures of the spunky cat on her day to day adventures! If you like the show, order the merchandise and be sure to visit the fine sponsors that make such a thing possible for the viewers! She even spent some time as part of various short lived superhero groups but never really seemed to have what it takes to be effective in the field. This eventually led her to doing what she does best: PR. As a public relations agent for the Protectors she weathered numerous disastrous incidents, doing her best to keep the teams reputation out of the red while handling merchandise and keeping her own slightly rusted star from fading. The death of the Protector All Star, her then boyfriend caused her to give up the position for a short time and move back to California in an attempt to bring her own career back to life. Ada puts up a fun, bubbly, stereotypical catgirl personality most of the time. She has used this persona for years, even before starting her TV show. This is all an act, however. Ada is spiteful, jaded, spoiled and vain. She acts much like you would expect a cat to, honestly. She is also much more intelligent than she lets out, but is generally too lazy to utilize it. She is not as silly as she lets on and is good at surprising people if she feels its prudent to drop the act. -Portable Storage: Basically hammerspace. Ada has access to a room of varying size and shape that she uses to store props and weapons. She doesn't like to actually go inside for more than a few seconds and usually just reaches into it real quick to grab things. She seems to instinctively know where things she needs are. -Catlike: Ada is very agile, flexible and graceful. She has excellent balance and nightvision and her senses of hearing and smell are greater than a normal humans. Her fingertips feature non retractable claws that are quite capable of causing harm. -Acting. Talent! : Despite her general reputation, Ada is not a terrible actress. She has everyone fooled into thinking she's a dumb little airhead, after all. She's an excellent liar, good at mimicking voices and can be very persuasive. -Fame Hungry and Vain: Ada is incredibly vain. She hates dropping her act even during important situations. She'll take almost any opportunity to be in the spotlight and can be colossally annoying. 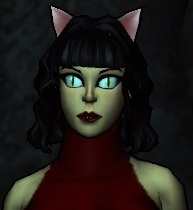 -...She's a Cat: Though she plays off the stereotype of the 'cute, friendly catgirl' often, the attitude and prejudices other people have for people suffering her type of mutations can be annoying. She is also less able to process things that felines have trouble eating than a normal human would, has an irrational fear of dogs and is somewhat easily distracted. -Joline Joelstone: One of Ada's assistants. Joline is a tech wizard and worked on Everyone Love's Neko. She is a serious fangirl, is obsessed with Japanese culture and has a small crush on Ada that the callous catgirl exploits to get her to keep working for her for minimal pay. -Jesse Sandmark: Another of Ada's assistants. Jesse was a producer for Everyone Loves Neko and followed Ada when the show was canceled. He does most of the editing for Superhero Patrol Show and works the merchandising aspect of the show. He also has feelings for Ada, but is more realistic than Joline. -Is almost constantly being followed by two little camera drones that record her experiences as a hero! The footage they take is edited to fit into her 10 minute webisodes on the "Superhero Patrol Show" website. -"Everyone Loves Neko" was all about Ada running around in silly outfits, doing silly things. It has a small cult following amongst lovers of both catgirls and absurdist television. -Had a role in a TV movie that never made aired. It was nothing special, but anyone that would be able to get a hold of it would be stunned by the performance she gives when they consider it beside her other work. This page was last modified on 10 April 2016, at 07:28.